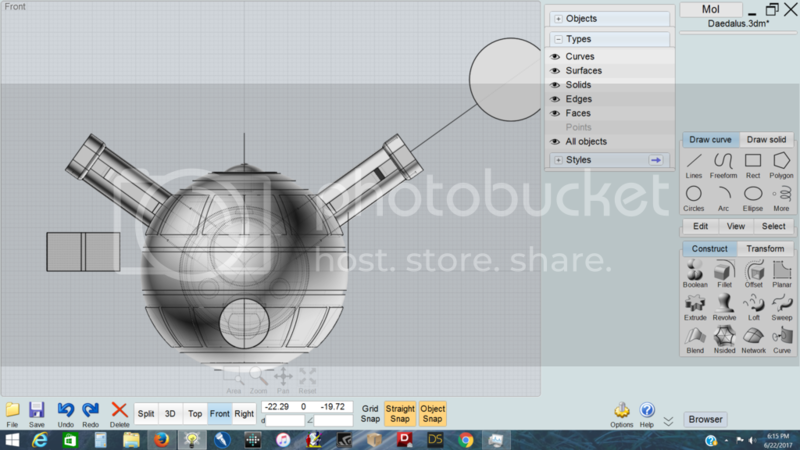 I'm currently working on my next CAD full ship model, the Daedalus-class refit in 1/1000th scale. The idea is that after Axanar and the Federation-Klingon War, the Federation had taken such heavy ship losses that even older ships were extensively refitted and pressed back into service for long periods of time. In this case, the Daedalus-class survivors received serious modifications, with enlarged and repositioned hull components, new engines, and so forth. - the primary and secondary hulls were placed in the same line for better balance. 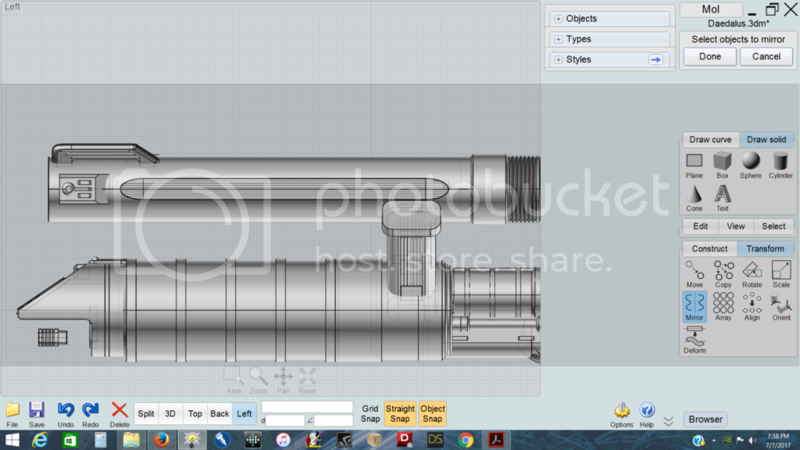 - a shuttlebay was added, making the secondary hull look a little bit like Vader's lightsaber. 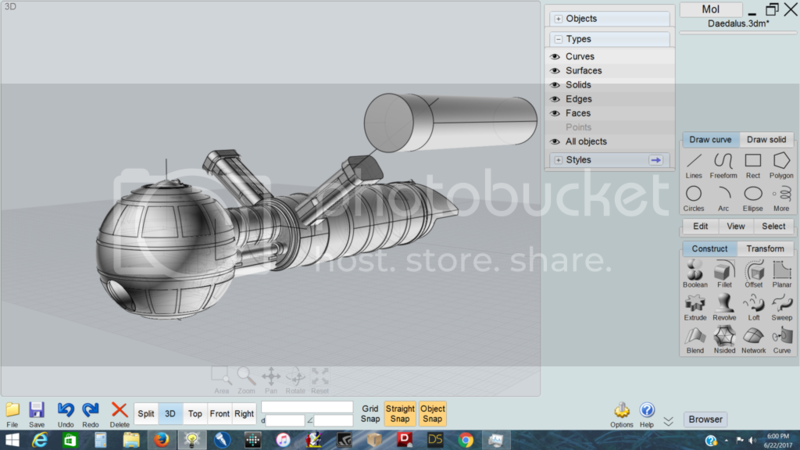 - an impulse engine housing wad added underneath the after hull cut out as it is apparently nowhere on the model shown in DS9, at least it isn't obvious. - the primary hull was textured to make it somewhat reminiscent of the Pasteur, creating a modeling link between the old and the new. - the connection, or neck is meant to be very industrial and brutally functional. 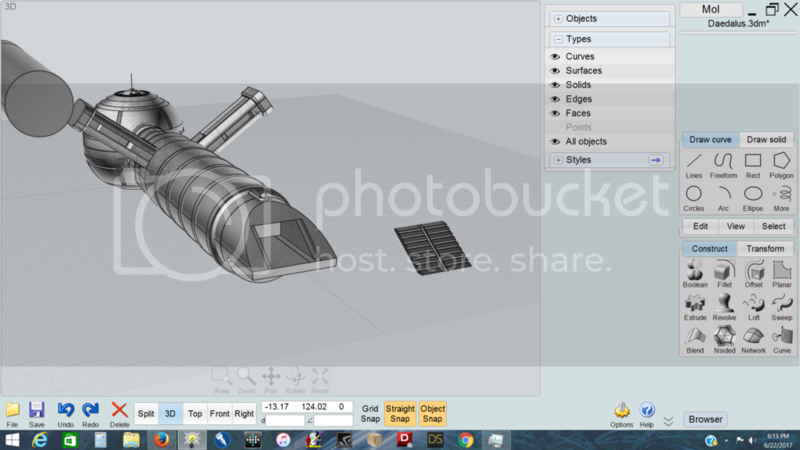 - determine weapons fit and placement. 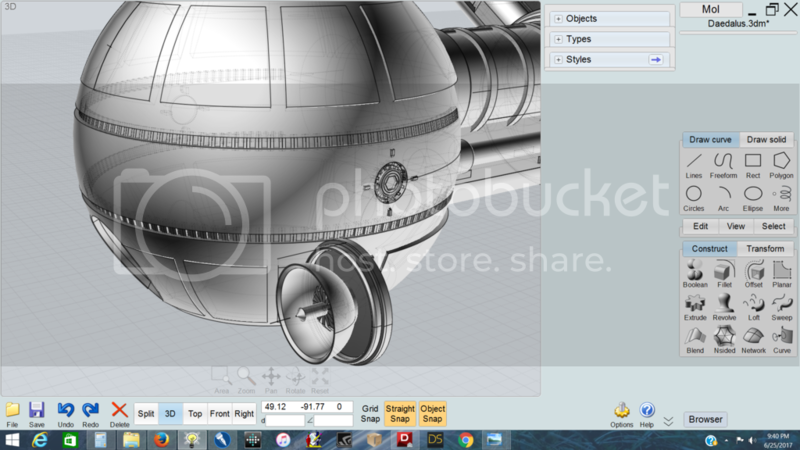 - add additional surface detailing, especially to the secondary hull and neck areas. 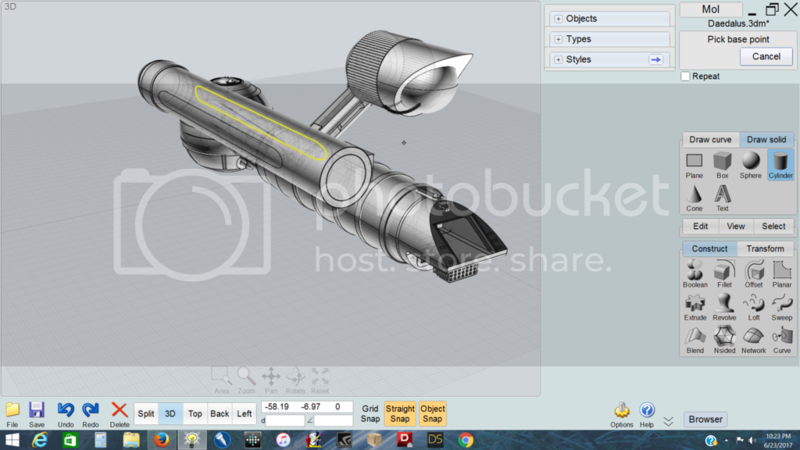 - determine how modern to make the warp nacelles, more TOS or "glowy" like the NX's nacelles. I'm leaning far more toward the TOS look. - Figure out the deflector arrangement. Anyway, I'd like to have this puppy done in a few weeks and then print it. Any suggestions or ideas for improvement greatly appreciated. 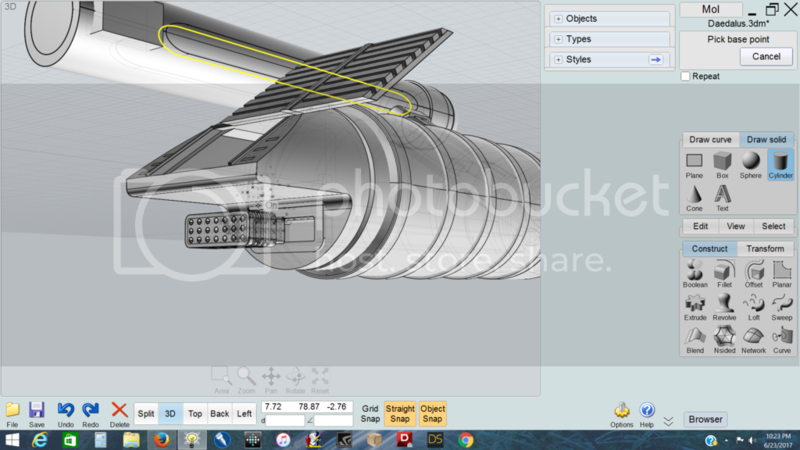 I haven't made a full CAD starship model since the BSG Argus, so I'm really excited about this one. Last edited by aptivaboy; 06-24-2017 at 08:22 PM. Many thanks. Any ideas for improvements? The warp engines are proving to be especially hard to do, to make them different from the TOS Enterprise's yet similar enough to be recognizable as from that universe. Okay, deflector antenna and assembly done. It's been deliberately simplified to allow for printing. Something this thin and tiny really needs to be done in injected plastic or PE, so it's a bit clunky, thickness wise. 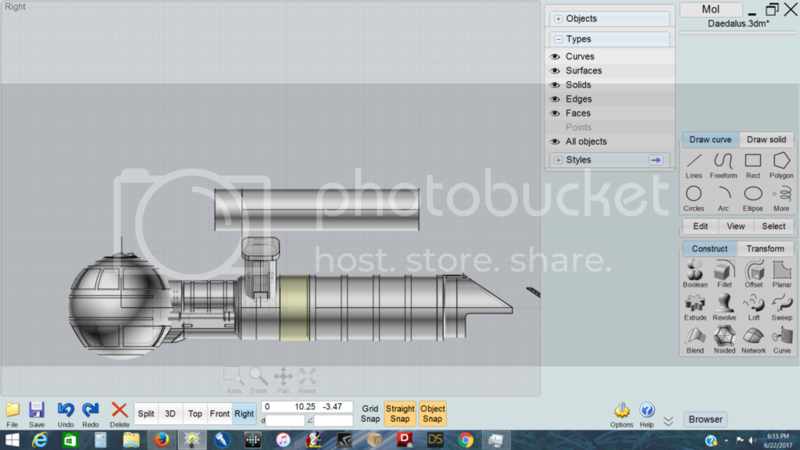 I'm not altogether happy with the airlock design, so that might be delete and altered. Sensor antenna were also added to the grooves on the upper and lower hemispheres of the globe. Okay, gotta catch kitty and make her take her meds. Let me know what you think, and what could be changed, altered, improved, etc. I'm always on the hunt for good constructive suggestions and criticisms. Very cool! Love all that detail and the main sensor area. What about a bit of edge detail around the outer opening of the recess? Panel line or slightly sunken/beveled lip? 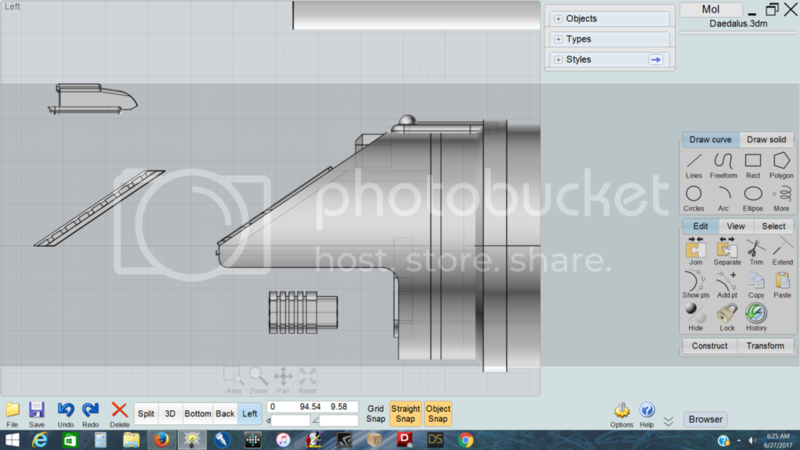 I've been working in things like that but the CAD program isn't cooperating. Or, more precisely operator error is creeping in! Oops, I just made a shuttle for her hangar. Pics to follow tomorrow. I hope it prints! Two views. The models are slightly different as I tweak the look, but this is about right. 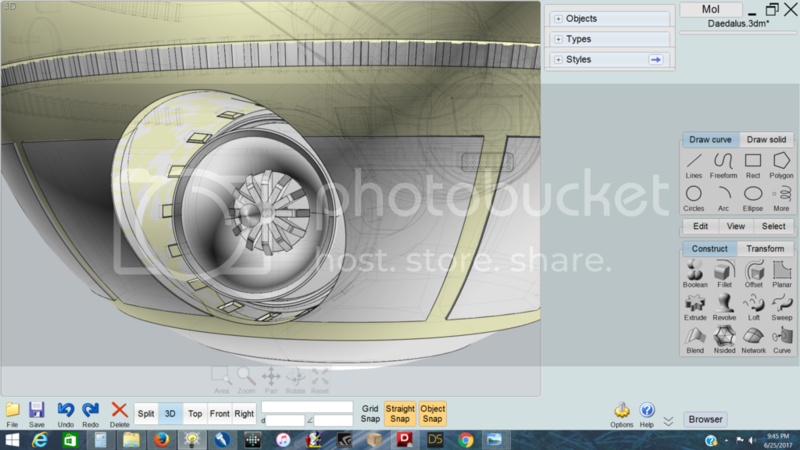 It's envisioned as a heavier cargo shuttle rather than a pure small personnel shuttle. The Daedalus-refit will carry one, perhaps two in her enlarged hangar bay. Sorry, it'll be a week before I can get back to the Daedalus. I had to put my kitty Emma (my icon photo) so sleep yesterday. She had a virulent form of bone cancer that was being treated that just took over and just went wild. 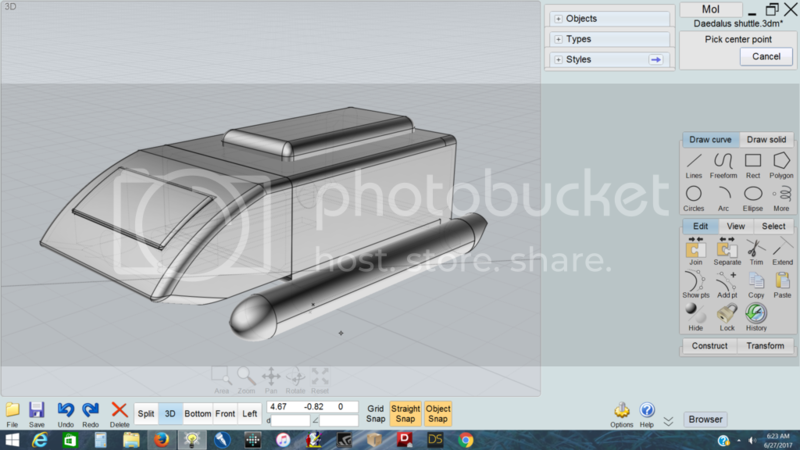 She was my plastic and CAD modeling buddy, always there with me, just keeping me company but never interfering. Seriously, she was just about the sweetest cat anyone can imagine. She didn't ever knock something down or play with my models. Basking in the sun was more her style. I came home from work yesterday, petted her and knew it was time. Anyway, I'm gonna need a few days. I'm so sorry for your loss Bob. We had to put our 15 year old dog down 3 days after Christmas. We know how you feel and you should take as much time as you need. Our best to you. My condolences. Loss of a pet is never easy. Sad to hear about your loss. We feel you. Worked on the engines. Just a sliver.